"We will not hesitate to strike a blow to anyone who will challenge us," says Defense Minister. 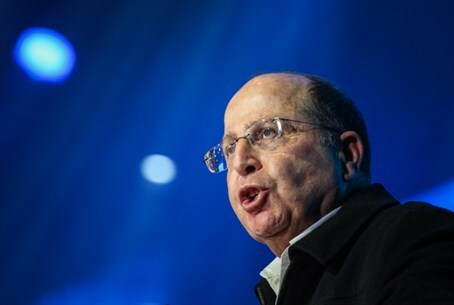 Defense Minister Moshe Ya’alon said on Thursday evening that Israel will extract a heavy price from Hamas over its kidnapping of three Israeli teenagers. Ya’alon spoke at an event honoring the 101st birthday of Brig. Gen. (res.) Yitzhak Pundak. He noted that Israel is in the midst of an extensive intelligence and operational effort "in order to find the kidnappers and the boys. The defense system - the IDF, the Israel Security Agency and the Israel Police - are allocating all the intelligence and operational resources required to bring back the boys." "In this case we are dealing with the Hamas terrorist organization, a ruthless, hateful enemy, whose aim is to harm Jews and Israelis simply for being such,” said Ya’alon. “In recent days we have detained many Hamas leaders in Judea and Samaria, while closing down their institutions and hurting their infrastructure. We will extract a very heavy price from Hamas leaders, wherever they may be,” he stressed. “We have no intention of compromising the security of the citizens of Israel, and will not hesitate to strike a blow to anyone who will challenge us along our borders and within them,” declared Ya’alon. The comments came as Operation Brother’s Keeper continued Thursday, with 30 more Palestinian Arabs having been arrested between Wednesday and Thursday, two of whom are terrorists who were released in the Shalit deal in 2011. A total of 53 of the terrorists released in the Shalit deal have been rearrested since the operation began. Whoever will be found to have violated the terms of his pardon will be brought before a military judge – unless he had been sentenced by a civilian judge – and can expect to go back to serving his original sentence. “Without regard to who is responsible for the action in Hevron in which three settlers were kidnapped, we stress that we have the right to provide assistance to alleviate the suffering of the prisoners, and to work to free them from the opposition's prisons,” Hamas spokesperson Sami abu Zuhri said. “The occupation is taking advantage of what is happening in Hevron to destroy Hamas in the West Bank and to destroy the agreement between Hamas and Fatah," he added.